Benefit, the creators of the #1 selling mascara at Sephora, called They’re Real!, is about to launch their newest creation: They’re Real! Push-Up Liner. I was lucky enough to snag one before the launch later this month. Here’s my review on this new liner that is attempting to redefine the eyeliner category. You’re probably already familiar with some, if not all, of the types of liners out there. Pencils, felt-tip markers, brushes, pots, etc. [If not, take a gander over at Let’s Get Lining: A Guide to Eyeliner] So what could be so innovative about Benefit’s new liner? It surprised me when I opened it. A capped “pen,” it looks pretty standard from the outside. You assume it’s going to be a felt tip or brush liner. Once you unscrew that cap, however, you see a thin, slant-tipped rubber end, with an orange plug in the end of it. Once you remove this orange plug, you turn the dial at bottom of the tube. After more than a few turns, you will see some black gel-cream emerge from the tip of the pen. Go slowly, though! If you push up too much, you have to wipe it off and start over. So that’s the first thing to watch out for. You might think that it would get messy and not be able to draw a razor-sharp tipped cat-eye. Not true. It does take time to get used to, though. Don’t be surprised if you have to use a couple of turns of the dial to line your entire eye. What’s nice about this liner is that it’s a matte black similar to a pot liner that you’d put on with a brush, but it’s far easier and less messy. The Push-Up­ liner is, I will say, more messy and complicated than a felt-tip or brush liner. Many of these types of liners, however, leave a slightly shiny finish, such as Stila’s liquid liners (still one of my personal faves). So, if you don’t mind a more glossy finish, I suggest just sticking with a traditional liquid liner. 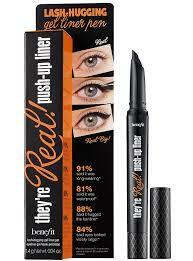 Otherwise, if you love a matte finish, but hate having to dip a brush in a pot of liner, Benefit’s They’re Real! Push-Up Liner might just be your godsend. Previous Previous post: The DipBrow Roadblock: Can’t Find Your Shade?